He asked Ken Speaks, who was at that time a teacher at the school, and he did a little research to discover that there were at least three of them. Andy Baxter then found another on the Old Wolverton Road, near to the Arden Park light industrial units and was led to believe that a third was in the cellar of the house on the corner of Jersey Road and Stratford Road – possibly Number 82. 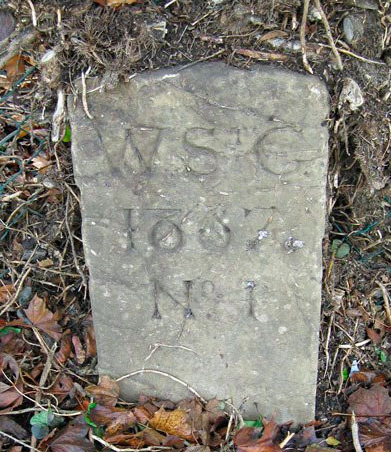 He doesn’t say if any dates were associated with these markers, but the location suggest that they were later. The original parish of Wolverton included the whole manor, from the east side of the Watling Street and bounded by the River Ouse to the north and Bradwell Brook to the east and south and this remained unaffected until the later middle ages when Stony Stratford was large enough to form two parishes – St Mary Magdalen on the east side and St Giles on the Calverton side. Holy Trinity continued to serve the extensive parish of Wolverton quite complacently until the arrival of the railway in 1838. As I have described elsewhere, the original land purchase by the London and Birmingham Railway was quite small but in 1840 they purchased another 22 acres to the south of the Stratford Road. 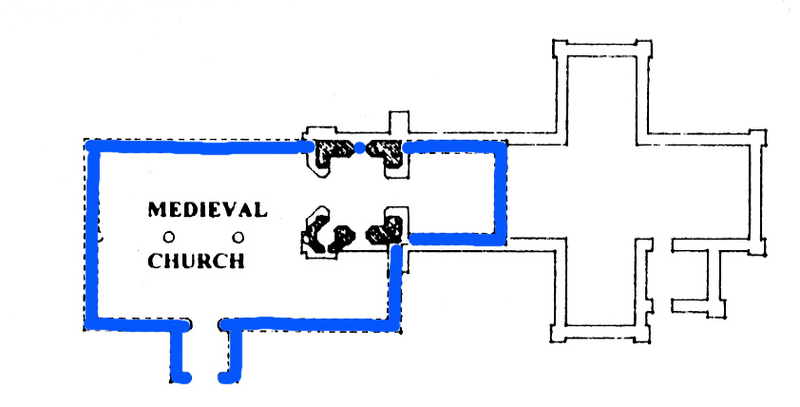 St. George’s was originally a chapelry and the first incumbent, George Weight, was styled Perpetual Curate. St George’s itself and the Vicarage was built on Radcliffe Trust land and the Radcliffe Trust retained a controlling interest for a number of years afterwards. 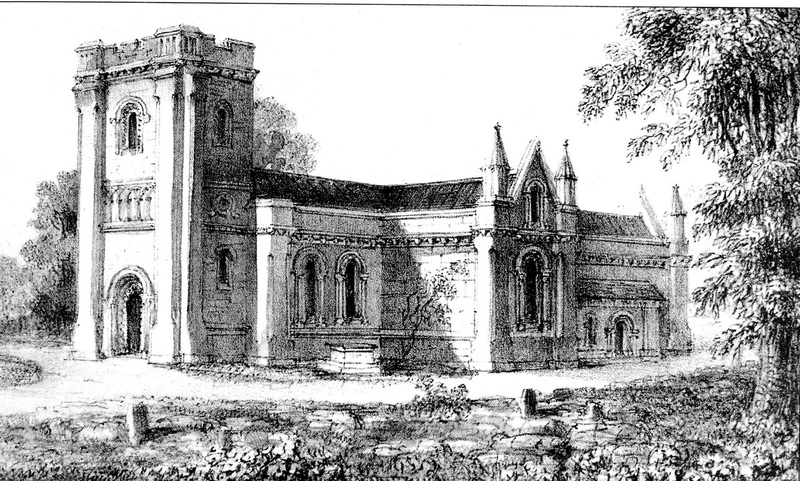 At about the time the church was completed the Church Commissioners, in recognition of the quite sizeable population, wished to create a new parish. Their first definition, that it would include all houses and buildings on the western side of the railway, met with opposition from the vicar of Holy Trinity, who foresaw that if Wolverton expanded further his parish would be gradually eaten away. In this he was supported by George Bramwell, Secretary to the Trust, who was already at odds with some of the directors of the railway company. Bramwell formulated a definition which was tied to a plan (such as the one above) and this was agreed to. The parish was thus created by Queen in Council on 19 May 1846. It may be after this that the first marker discovered by Andy Baxter was installed. The Radcliffe Trust then resisted further expansion and would not sell any land for housing development until 1860. 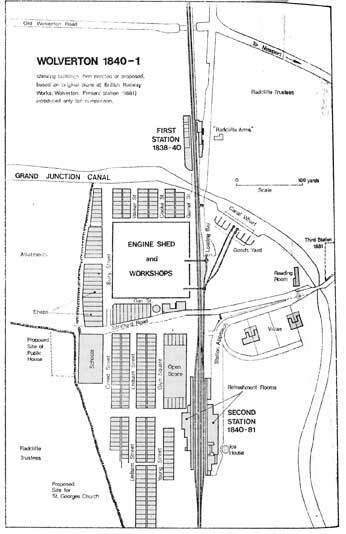 In the meantime, the L&NWR were forced to develop New Bradwell in order to accommodate their workers. When the expansion did come, it went as far west as the back alley before Cambridge Street. Possibly, when the parish thus expanded, a marker was laid down here. Wolverton so remained until the next expansion of the 1890s which saw the development of Cambridge Street and Windsor Street. At the turn of the century, the Radcliffe Trust itself, bowing finally to the inevitable, developed its own streets to the west of Windsor Street, including Jersey Road and Anson Road. I don’t know the detail as yet, but it sounds to me from Andy Baxter’s description, that a new parish boundary was determined at Jersey Road. I do recall that Anson Road residents tended to use Holy Trinity and Jersey Road residents tended to split both ways – some went to Holy Trinity and some to St George’s. My grandparents, who lived at 179 Church Street, went to Holy Trinity for example. After the National Insurance Act was passed in 1948, benefits offices paid out sick benefits every two weeks. If you ever wondered why it was set up this way (and you probably didn’t) it was because the Government was latching onto a much older tradition.From 1948 those who claimed sick benefit had to produce a doctor’s certificate every two weeks and benefits were paid accordingly. I don’t know what system prevails today. In the Churchwarden Accounts for Holy Trinity payments to the sick are made every two weeks. Judging by the names that are repeated most of these cases are for old people or those with long term illnesses. I doubt if a cold or a sniffle would have got much sympathy from the overseers. In any case, with payments of only 2 shillings a week, nobody would willingly wish to see their income cut by two-thirds. Paid Wm Clark 2 weeks at 2/- 4s 0d. and these amounts repeat every two weeks. It is not clear why some were paid different amounts, although this would suggest that other factors were taken into account, such as age and household income. Most of these people I would judge to be seriously ill as the payments go on for some months. There are few, if any, examples that I have seen where someone appears on the books for a week or two and then restored to health, so as I remarked earlier, nobody took time off for minor complaints. The money was provided only to alleviate extreme hardship. 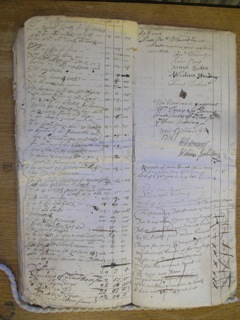 Received of John Tucker on account of Mary Edmunds Child £20 0s 0d. This was the usual practice when a man responsible for getting an unmarried girl pregnant was assessed a fine to defray the cost to the Parish – in this case £20. Some months before this entries for payments to “Tucker’s Girl” begin to appear, starting with a payment of 2/6d for one week on July 20th 1808. Thereafter, there are regular payments of 2/- a week, paid every fortnight, to Tucker’s Girl. The subsequent account references tell a story. In September there is a payment of 4/- to the magistrates for a removal certificate and a few days later a payment of 6/6d to “a man to Convey Tucker’s Girl to Marsh Gibbon out 2 days.” The payments of 2/- a week continue and then on November 5th there is a payment to Bet Williams “for Tucker Girl Towards her Months” – 10s. And again on November 19th another payment of 10s. “Paid Bet Williams on account of Tuckers Girls Month.” She gets a similar payment on November 25th and December 3rd and on December 10th is give a further 2/6d for extra trouble. Weekly payments to Tucker’s Girl continue to january 7th 1809. Thereafter, Mary Edmunds is entered under her own name and is paid £1 every 10 weeks (still at the 2s a week rate) for a year after this. I assume until the £20 is used up. My reading of this is that the pregnancy of Mary Edmunds is first recognized and acknowledged in July. She is thereafter paid at a rate of 2s a week. The initial reaction must have been for her to move to Marsh Gibbon, presumably where she had relatives, but that she may have chosen to return. The removal certificate was required for movement from one parish to another at this time. Bet Williams is the midwife who is paid 10s. a week during Tucker’s Girl’s last month of confinement. Bet Williams appears in other unrelated entries, so she must be local to Wolverton. It is interesting that she is only described as Tucker’s Girl until the child is actually born and John Tucker has made his payment of £20. I assume that if the pregnancy had not gone to term or the child had not survived then John Tucker would not have been liable for the whole amount. I assume that Mary Edmunds is not named because of some arcane notion that if no child survived birth then the stain of illegitimate birth would not attach itself to Mary Edmunds. John Tucker was probably already married when he got Mary Edmunds pregnant, so she was effectively on her own. 2s a week amounted to bare subsistence and was the rate paid to the sick, so out of the £20 put up by John Tucker, she received about 20 months support after the other expenses were deducted. Options for girls in this situation were extremely limited. Support could either come from her immediate family or she could get married. One of my own ancestors got herself into this predicament as a sixteen year old in 1822 when she gave birth to my great great grandfather. Paternity was acknowledged by the already-married farmer, and recorded in the Leighton Buzzard register with a £50 bond. Two years later she married an older man who was able to provide for her and her son. She had no more children and her son took over his adoptive father’s business and did fairly well for himself. I hope the Mary Edmunds story had a satisfactory outcome. Until we developed a more complicated society local government was localised to the Parish. Justice was dispensed by the Justice of the Peace (often the Lord of the Manor) and social welfare was administered by the Church, usually in the person of the Churchwardens. The Holy Trinity Account Books for the 18th and 19th centuries survive and are kept in the Buckinghamshire Archive. They record payments made to the sick, the widowed and the poor and managed the costs of out-of-wedlock pregnancies. Two of their number were appointed overseers for the year beginning in April It appears that they divided the parish, which extended from Bradwell Brook in the east to Watling Street in the west. I am not sure how it was divided. The overseers appear to come from the ranks of the larger farm tenants. The new overseers for 1809-10 are Robert Battams from Stacey Bushes Fram and William Wilkinson from Brick Kiln Farm. The rate, at 1/6d in the Pound, was assessed only against land and property, so the farmers had a vested interest in the management of this money , which they appear to have managed very carefully, because there was usually a surplus of income over expenditure. The Poor Law Act of 1834 replaced this system, which had become inadequate to the purpose by the 1820s and moved the administration to a larger administrative district, the Poor Law Union, which was subsequently based at Potterspury. by 1/6 Rate £271 11s 0d. April 3rd 1809. At our annual meeting this day held we have perused the preceeding accounts of Thos. Ratcliffe and John Brill and approve of the same and find due to the Parish Eighty Pounds eight shillings and two pence halfpenny which we Direct to be Paid to Robert Battams and Wm Wilkinson who were appointed to be overseers for the ensuing year. Tomorrow I will explain why John Tucker contributed £20. Oliver Ratcliffe, in his History of the Antiquities of the Newport Hundreds, compiled a list of the Vicars of Wolverton, which I reproduce here with one amendment. 1673 Alexander Featherstone M.A . 1838 Henry Reade Quartley M.A. The amendment to his list is the date of Henry Quartley’s incumbency. Samuel Hale died in 1794 and Quartley, who was a nephew of a former Radcliffe Trust estate manager, was appointed thereafter. e was certainly the incumbent in 1797 when he began to make representations to the Trust for a building and repair program. Ratcliffe says that he was also appointed to the living of Stantonbury in 1832, which he was, but this date is shown as his appointment to Wolverton in a history of Holy Trinity, when by this time he was fully entrenched. Quartley died in 1838 and was succeeded by his son, Henry Reade Quartley. I have also come across some references in the 13th century Wolverton deeds held in the Bodleian Library. These all relate to the the time when William FitzHamon was Baron, so as they are undated, they could relate to any time between 1220 and 1247. William son of Hamon grants and confirms to William Capellanus of Wolverton with 1/2 virgate in Wolverton which Hugh Capellanus once held. In another deed (244) he is a witness as William the vicar of Wullverton, and in another (474) the grant of a piece of land is described as between the land of Master William Vicar of Wlverton. The deeds clearly describe William as Vicar of Wolverton and the first deed identifies a half-virgate of land (15 acres) which was probably assigned to support the vicar. This would suggest a line of Hugh, followed by William, before Alan becomes the incumbent circa 1240. For the most part these vicars maintained a living by having a piece of land attached to the church, usually known as glebe land, and through tithes – payment in kind of a fraction of the yield of the peasantry. Some of this was used to maintain the church and support the Priory. After the dissolution of the monasteries these practices continued until the church and rectory came back into the hands of the Longueville family in the 17th century. For about 100 years after that the income of the vicar was a matter of dispute until it was finally put to rest through a court hearing in 1805.